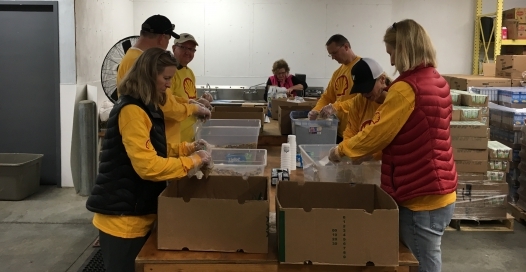 As part of September’s Hunger Action Month, Anvil partnered with Shell Puget Sound Refinery to participate in a friendly “Granola Bar Challenge” to collect granola bars for Helping Hands Food Bank in Sedro Woolley, WA. Anvil is the proud winner of the challenge, collecting over 7,750 granola bars! In addition to the challenge, Anvil and Shell employees teamed up for a joint community service activity to pack the granola bars collected into backpacks full of various food items for Helping Hands Food Bank’s “Food for Kids Program.” About 700 of these backpacks are provided weekly to children in the community to ensure they are fully nourished and able to thrive. A huge THANK YOU to all Anvil and Shell Puget Sound Refinery employees who donated granola bars and especially those who volunteered to fill backpacks. 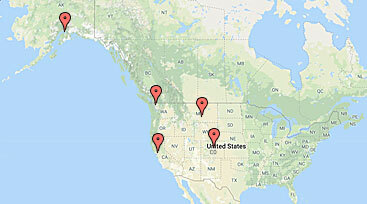 Helping Hands Food Bank is Skagit County’s largest direct emergency food provider. Last year, they distributed over 2.2 million pounds of food to over 14,000 people. Over 60% of the clients they serve are children and seniors. The nonprofit organization works with local food providers and community organizations to provide the best services possible. Learn more about Helping Hands Food Bank and ways to donate at www.helpinghandsfoodbank.org. Anvil employees have been participating in Engineers Without Borders USA (EWB-USA) since shortly after its founding in 2002, working to enhance the lives of others by improving the living conditions of those in developing countries. Anvil employees have been participating in Engineers Without Borders USA (EWB-USA) since shortly after its founding in 2002, working to enhance the lives of others by improving the living conditions of those in developing countries. Anvil’s Mike Moora and other members of the EWB Alaska Professional Chapter (EWB-APC) recently traveled to Malawi to begin assessment of a new water treatment and distribution system for a local community. When completed, this project will enable the distribution of clean water to several thousand villagers. Anvil employees collected nearly 200 toys in this year’s Toy Drive to support the Ronald McDonald Seattle House. Toys donated to the Ronald McDonald House benefit children of families staying at the Seattle House during the holidays. Anvil employees collected nearly 200 toys in this year’s Toy Drive to support the Ronald McDonald Seattle House. Toys donated to the Ronald McDonald House benefit children of families staying at the Seattle House during the holidays. We’re honored to donate to a great cause and provide a glimpse of joy and happiness to many families during a difficult time. The goal of the Ronald McDonald house is “to help families focus on their child’s healing – so we ensure families don’t have to worry about basics like a place to stay, where they will find their next meal, or where they can take a shower.” The Seattle House started in 1983 with just 20 rooms and has since been renovated to now serve up to 80 families per night. The Seattle House has provided over 28,000 nights of housing to nearly 500 families per year whose child is receiving treatment at Seattle Children’s Hospital. Learn more about Ronald McDonald House Charities and ways to donate at www.rmhcseattle.org.